The 32 Observations series continues with Nathan Jahnke, PFF’s Director of Analytics, finding an interesting piece of information about all 32 teams after eight weeks of football. If you would like to make some observations of your own, you can do so with PFF Elite, where you can find several signature statistics for every offensive and defensive position in football, thanks to Premium Stats 2.0. Buffalo Bills: Running back LeSean McCoy has 40 carries of 20 or more yards over the past five years. That is 10 more than any other back in that time. 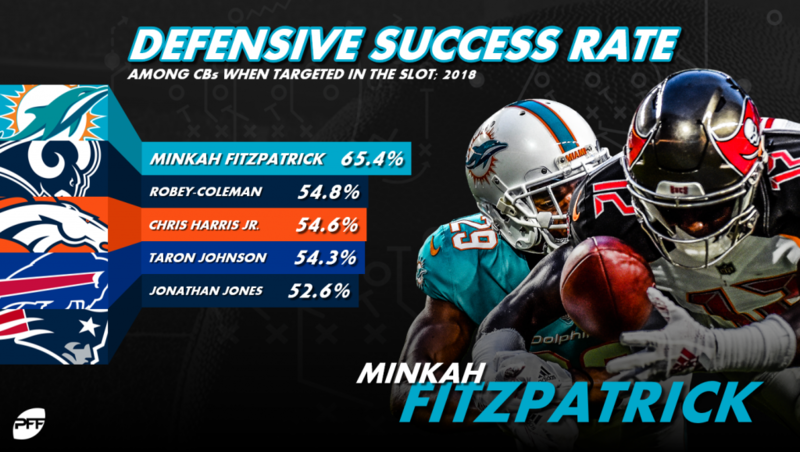 Miami Dolphins: When Minkah Fitzpatrick has lined up in the slot, he’s been thrown at 26 times. On those plays, he has one interception, 11 passes have fallen incomplete, and on another five he made a tackle for a stop. That 65.4% defensive success rate is the best rate for slot cornerbacks this season. New England Patriots: Stephon Gilmore has allowed a 40.9% catch rate this season, which is the second-lowest mark among cornerbacks this season. New York Jets: Over the last four weeks, Brandon Shell has allowed one sack, no hits and three hurries. His 2.94% allowed pressure rate is the second-best rate among right tackles in that span. Baltimore Ravens: Since the start of the 2016 season, running back Ty Montgomery has averaged 3.44 yards after contact per carry, which is the second-best rate for backs with at least 150 carries in that span. 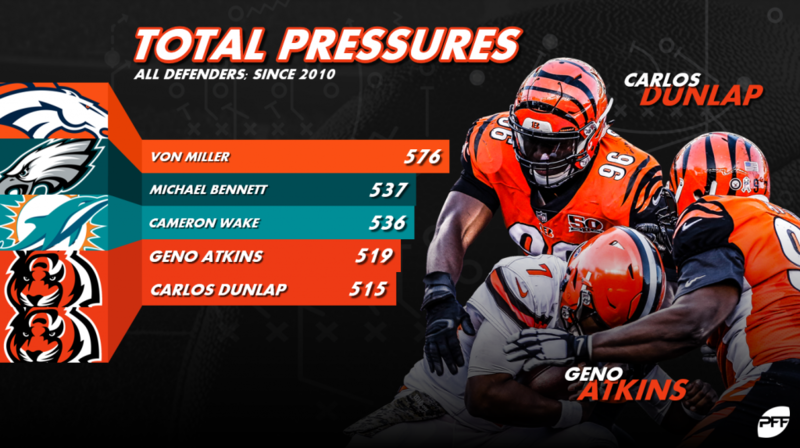 Cincinnati Bengals: In 2010, the Bengals drafted Carlos Dunlap and Geno Atkins. Since then, only five players in the NFL have 500 or more quarterback pressures, and that includes Atkins with 519 and Dunlap with 515. Cleveland Browns: Both Larry Ogunjobi and Trevon Coley have six tackles for loss or no gain in the run game. The Browns are the only team with two interior defenders who have six or more. Pittsburgh Steelers: James Conner has 19 carries of 10 or more yards, which is the second-most for any running back this season. Houston Texans: When Demaryius Thomas lines up as an outside receiver, he averages 5.45 yards after the catch per reception. That is the second-best rate for outside receivers since 2010. Indianapolis Colts: Darius Leonard has 18 run stops this season, which is the second-most for all rookies, regardless of position. Jacksonville Jaguars: Since the start of the 2015 season, Telvin Smith Sr. has 130 run stops, which is the most for a linebacker in that time. Tennessee Titans: Dion Lewis is averaging 0.27 missed tackles per carry, which is tied for the best rate among backs this season. Denver Broncos: When edge defender Bradley Chubb lines up on the right side as he usually does, he has produced pressure on 15.8% of his pass-rushes. That is the third-best rate for all edge defenders from the right side. Kansas City Chiefs: Mitch Morse has allowed no sack, one hit and two hurries on the season. Allowing pressure on 1.46% of pass blocks is the third-best rate for centers so far this season. Los Angeles Chargers: Austin Ekeler had his 100th career rushing attempt in Week 7. He has run for five or more yards on exactly half of those carries. Gaining five or more yards on half of his carries is the best rate for all backs over the past five years. Oakland Raiders: Over the last three weeks, Erik Harris has three pass breakups, which is tied for the most for safeties in that time. Dallas Cowboys: Over the last four seasons, Amari Cooper has averaged 5.22 yards after the catch per reception when lined up as an outside wide receiver. That is the best rate among the 35 receivers with 1000 or more routes from the outside in that time. New York Giants: Saquon Barkley has forced 25 missed tackles as a receiver. That is the most by a running back after Week 8 over the last 13 seasons. He is also the only running back to have over 500 receiving yards after the catch at this point of the season. 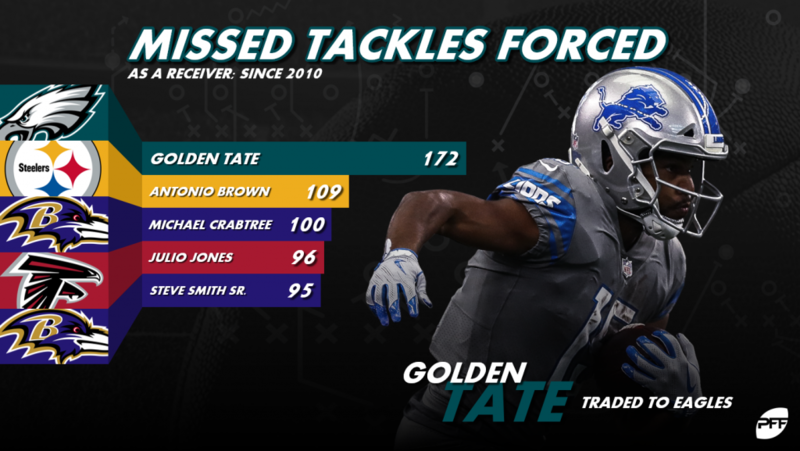 Philadelphia Eagles: Since being drafted in 2010, Golden Tate has forced 172 missed tackles. That is 63 more than any other wide receiver in that span. Washington: Over the last four seasons, Ha Ha Clinton-Dix has made 117 tackles in the run game while only missing 6. Making 96.2% of his tackle attempts is the best rate for safeties in that span. Chicago Bears: Bears receivers have dropped five of Mitchell Trusbisky’s passes this season. That is just 2.1% of his attempts, which is the second-lowest drop rate for any quarterback in the past decade after Week 8. Detroit Lions: T.J. Lang has allowed no sacks, no hits and three hurries this season. Allowing pressure on 1.96% of his pass blocks is the second-lowest rate for right guards this season. Green Bay Packers: Aaron Rodgers has thrown away 32 passes. Only three quarterbacks threw away more passes in all of 2017. It is also 11 more than any quarterback has ever had at this point in the season. Minnesota Vikings: Kirk Cousins has 10 touchdowns on deep passes. That ties how many he had all of last year, and is the most for any quarterback after Week 8 since 2006. 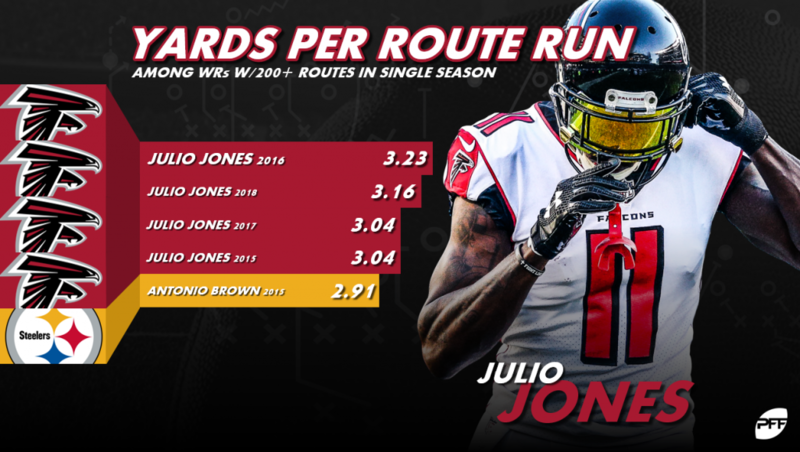 Atlanta Falcons: Over the last four seasons, there have been four times where a wide receiver had 200 or more routes run and 3.00 or more yards per route run. Those four are Julio Jones in 2015, Julio Jones in 2016, Julio Jones in 2017 and Julio Jones in 2018. Carolina Panthers: Luke Kuechly has 14 stops in coverage, which is tied for the second-most among all linebackers. New Orleans Saints: Over the last five seasons, Terron Armstead has allowed pressure on just 3.74% of his pass blocks, which is the second-best rate for left tackles in that time. Tampa Bay Buccaneers: Justin Evans has 18 tackles in the run game with no missed tackles. That is the most tackles for any safety with no misses yet this season. Arizona Cardinals: Antoine Bethea has 19 stops this season, which is the third-most among all safeties. Los Angeles Rams: When Dante Fowler Jr. has lined up on the defenses left side in a three-point stance, he’s produced pressure on 16.1% of his pass-rushes. That is the fourth-best rate among the 30 edge defenders with at least 75 pass-rushes in that situation. San Francisco 49ers: George Kittle has 399 yards after the catch, which is 99 more than any other tight end this season. Seattle Seahawks: When Russell Wilson is not under pressure, he’s thrown a touchdown on 9.9% of his passes. That is the second-best rate for quarterbacks after Week 8 in the past decade.